We’ve discussed the mechanisms by which species arise, given enough time and environmental circumstances. These mechanisms account for the means by which evolution occurs–in other words: natural selection. Would nature select for or against the albino turtle? How would this selection take place? What can be said about the trait that results in albinism? This entry was tagged animals, AP Bio, Chapter 15: Evolution. Bookmark the permalink. Albinism is a really rare trait. This trait is the absence of pigmentation in the skin, hair or eyes due to a defect in the organelle that produces melanin. Contrasting humans, animals have many different pigments and for this reason albinism is considered a hereditary condition characterized by the lack of pigment in feathers, skin, eyes or scales. I believe that Albino turtles are less capable of surviving since their trait of lacking color eliminates their ability to defend themselves making them an easy prey for other organisms. This makes nature select against the Albino turtles. In conclusion, Albinism is a recessive trait in the genes of a turtle, also meaning less could have it reducing their amount of deaths. Albinism is a defect of melanin production, resulting in the host having little or no color in the skin, hair, and/or eyes. The most severe form of albinism results in the acquiring of white or pink hair, skin, and iris color as well as problems with the vision. Being a recessive trait means that the chance of it passing to the offspring depends largely on having the recessive traits on the parents, it could have a 0% chance as it could have a 100% chance. When talking about the albino turtle, natural selection would be against the albino turtle, especially if the normal pigment containing turtle uses its colors for camouflage which the albino turtle wouldn’t be able to achieve. If the albino turtle has the oculocutaneous albinism, the most severe form of albinism, it could also have problems with its vision, lowering its chances of survival. I saw the article of Tanzania’s albino community. It’s very hard to understand why some people would kill others because they don’t understand Albinism well. But, in other parts of the world Albinism is accepted and not called as an inferior trait. The Hopi and Zuni Indians have many individual albino males who get married and have healthy children (Woolf 2005). In Hopi tradition, the albino males were allowed to be in the villages to avoid bright sunlight and it’s effects. This made albinos to have the opportunity to engage in sexual activity (Hedrick 2003). They say Albinism is just a cultural selection, this trait is not either good or bad is like any other trait. It’s very important to study Albinism because we can know how to save people since Albinism lowers the percentage of survival. But, this does not mean that albinos are inferior from blacks, whites, asians, etc. Phenotypes—we will see plenty of examples—are circumstances that, most of the time, cannot be avoided. Theses circumstances are nucleic acids—polymers millions of miles long—in sequences that can mean African, Asian, Latino, Caucasian, Albino, etc. Why should people suffer because information responding to circumstance—rain forest, desert, glacial, taiga, etc. Human beings need to over come its addiction to phenotypes—in other words, racism is irrational. Albinism is a condition you are born with characterized by the lack of pigment that naturally gives color to the skin, hair and eyes. Having this in mind, I think that nature will most likely select against the albino turtles given that their bright color makes them stand out to their predators. This trait is more of a disadvantage than an advantage since they can be seen from larger distances and makes it most likely for them not to reach adult age. Because of this, albino turtles will not be as abundant in nature as other animals who are not as exposed as these turtles are and can blend in with their environments. This causes them to be able to reach adulthood and be able to reproduce in larger numbers than maybe albino turtles can. Natural selection has been taking place since the beginning of life. It is also known as survival of the fittest. For example, when a dog has several puppies but one is born with cleft lip, the mother will set it aside, not nurter it and make sure for the survival of the organisms with the characteristics that best helps it adapt to its environment. Many of the forms of albinism are recessive, that in other words means that a child inherits one abnormal gene from each of its parents. The parents which are one in like 25 of them are carrier, its also someone who has abnormal gene and one that works normal. In albinism there are many types, but the ones that are mostly related to natural selection are the Ocular albinism that it only affects the eyes, but not the skin or hair. The other one is Oculocutaneous albinism which affects the eyes, skin hair and also includes several different forms. OCA1a is the type of albinism have no pigment and no active tyrosinase, the OCA1b have some residuals tyrosinase activity. Natural selection is an important aspect of life that helps the turtles evolve and continue to reproduce. It also reflects what the turtle, depending on its environment where it was born and with certain characteristics to help it survive in that enviroment. Albinism is rare, but it occurs in almost every type of animal. Why? It occurs in all kinds of animals because we are all part of the animalia kingdom. As it happens in human beings, animals also produce pigments, in other words if their is also a defective gene for pigment production in an animal they are going to develop albinism. Albinism is the lack of melanin, a dark pigment that results in the natural coloration of the skin, scales, eyes or hair. This causes that the animal be produced with albinism. Albinism is an inherited trait ,meaning that it is genetically passed from parent to offspring. With this information, I think nature would be in favor of the albino turtle even though it is rare, albinism, it is natural but the albino turtle would no be able to camouflage from predators, may have an increased sunlight sensitivity and impaired visual communication. Albinism is (like stated in many other comments above) a defect of melanin production that results in little or no color (pigment) in the skin, hair, and eyes. While searching the web for information on this topic I found a interesting website which talked about what happened to these four albino turtles who hatched in Vamizi Island in 2003. This study talks about the probability of these turtles (which only 2 out of the 4 made it to sea) surviving out on sea. They point out as well that only 1 in 100 (or 1 in 1000 depending on the source) survive to adulthood. So the answer is: if they manage to survive their first few days then they will have the same chance at survival as regular turtles. Albinism is a genetic condition which aids in the lack of melanin and partial or complete absence of pigment in the skin, hair and eyes. This is a hereditary disease and there is a 1 in 300 chances of an organism having the trait. In this case, albinism is not helping the turtle survive in its environment because its lack of pigmentations allows for the turtle to be spotted easily by its predator, and it prevents the animal from reaching its reproductive age. With that said, albinism is a recessive trait. Albinism is a trait that anybody can have. It results in little or no color (pigment) in the skin, hair, and eyes. From reading various sites I’ve learned that the albino turtles have an advantage when beginning live. They hatch bigger than other hatchlings and bigger hatchlings can run faster, swim faster, and avoid getting eaten by things with slightly smaller mouths. But at the end it is all up to natural selection. There is always the chance that these animals could act like us and not care about looks even though it could affect some survival rates. All the same, life and nature are unpredictable and it would take some further research to find out if these albino turtles could survive. Albinism is an inherited genetic condition that reduces the amount of melanin pigment formed in the skin, or hair and/ or eyes. Albinism occurs in all racial and ethnic groups throughout the world. Albanism animals almost insurmountable odds when they’re born in the wild. Baby albinos are seen as an oddity within their own species and are more visible to predators. These animals may be cursed with imperfect vision or other heath problems. I think natural selection will be against the turle becaause it can be seen by the predators and it can have problems with the vision. In the following link it shows different species with albinism http://webecoist.momtastic.com/2009/11/10/do-the-white-thing-7-more-amazing-albino-animals/. While the discovery of Albino turtles is fascinating and rare it is no less true that they do do oppose a great disadvantage in comparison with other turtles because of predators. Like stated in other comments, albinism is an inherited genetic condition that reduces the amount of melanin pigment formed in the skin, hair, and/or eyes: http://www.albinism.org/site/c.flKYIdOUIhJ4H/b.9253761/k.24EE/Information_Bulletin__What_is_Albinism.htm . Albinism is a very rare trait passed genetically from parents to offsprings. It is an effect in the melanin production, a dark pigment that results in normal coloration in the skin, scales, eyes or hair of organisms. Apart from the pigments, albinos share all the other characteristics of other members of their species. This trait is recessive while normal pigmentation is a dominant trait, this makes it very rare to find cases. For organisms, pigmentation can be very important for their survival. Having a such a unique color makes them standout in nature making them easy predators and they also lack protection from ultraviolet sun rays which increases the possibility of future skin cancer. Because of this consequences, we can conclude that nature selects against this rare creatures. Their unique color makes them gorgeous, impressive creatures. Albinism is a condition organisms are born with because of a recessive trait passed down from its parents. It is the absence of melanin, which is the natural pigment that gives color to skin, eyes, and in the case of mammals, hair or fur. 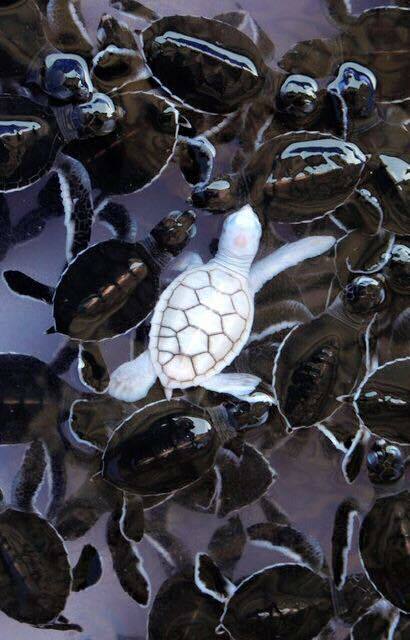 In the picture above, an albino turtle is seen. Nature selected against the turtle because its white body is less resistant to the sun’s radiation. Another example is that turtles usually camouflage with nature by standing still to make themselves undetectable to predators, the white skin of the albino turtle prevents it from hiding therefore making it an easier target. Finally, it has been proven that albino animals are usually rejected by other animals of the same species. This could also make survival harder for albino animals in the wild. This is also seen with humans that reject and even kill others just because they are albino. It can be said that albinism is a way of nature selecting against an organism because it makes it harder for it to survive. Even though albinism is usually seen as a negative thing, I think that it can also be seen as something positive. Albino animals look amazing and we should feel lucky to be able to witness their beauty. This link has more information and pictures of albino animals. Here is a link with pictures of albino animals that look amazing. This link has more information about albino animals. Albinism is a condition where a person or animal have a strange genetic disorder with the absence of pigments in skin, hair, and eyes. Cells of albinos are unable to produce melanin, the low production of melanin causes an animal or parts of the animal to appear white, pink, or to have a kind of bleached look. Albinism is caused by a mutation in some gene that interfere with the enzyme tyrosinase which synthesizes melanin from the amino acid tyrosine. Depending on the mutation, melanin production can either be slowed down or completely stopped. One of the most common physical problems related to albinism is the increase of possibility to a mayor sunburn and skin cancer. In my opinion, nature would be against albino organism because being albino will just another disadvantage for the organism to survive in the environment making it more difficult for the animals to survive. Mutations can be the result of errors in the genetic code. But these errors could be advantages in more challenging contexts. Albinism is a rare group of genetic disorders that cause the skin, hair, or eyes to have little or no color. It is most probable that natural selection will punish the albino turtle because it has a lower rate of occurring since it is a recessive disease, and it has less chance of surviving because it can be so easily spotted. There are many types of albinism that only affect certain parts of the body or only certain pigments.http://messybeast.com/albinism/albino-index.htm Also albino people can’t receive much sunlight because they are really sensitive to it and it quickly damages their skin. Imagine not being able to tan on the beach?